Calvert Pond is on Prospect Lake Road. The parking is just a little bit of the shoulder of the road that is barely enough parking for a few cars. Look for the wooden post with the hiker symbol on it. The trails in this park are mostly narrow and there is a lot of up and down over rock outcrops. We took the trail to the pond side trail first to see what we could see in the pond. We heard and then saw a big bullfrog but we didn't see the beaver whose lodge you can see across the pond. I suspect that the beaver is nocturnal. 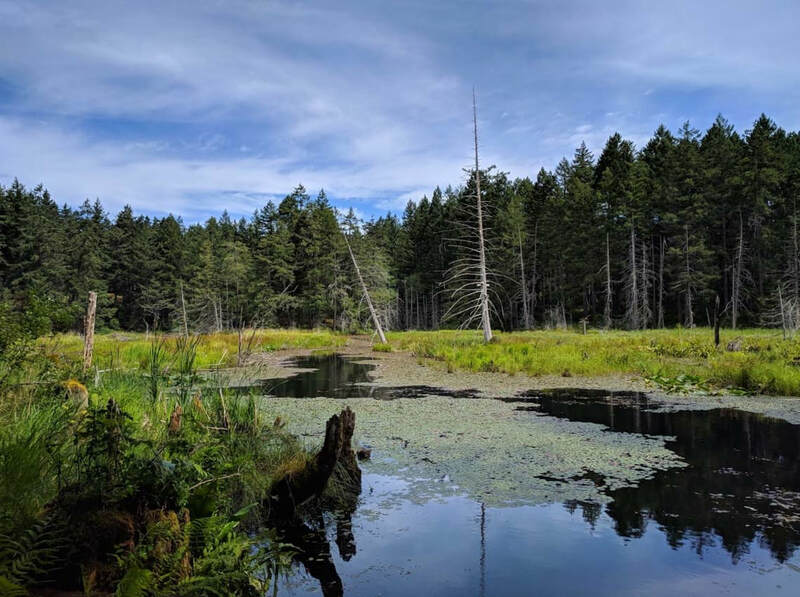 This area has several ponds and small lakes that have beavers. 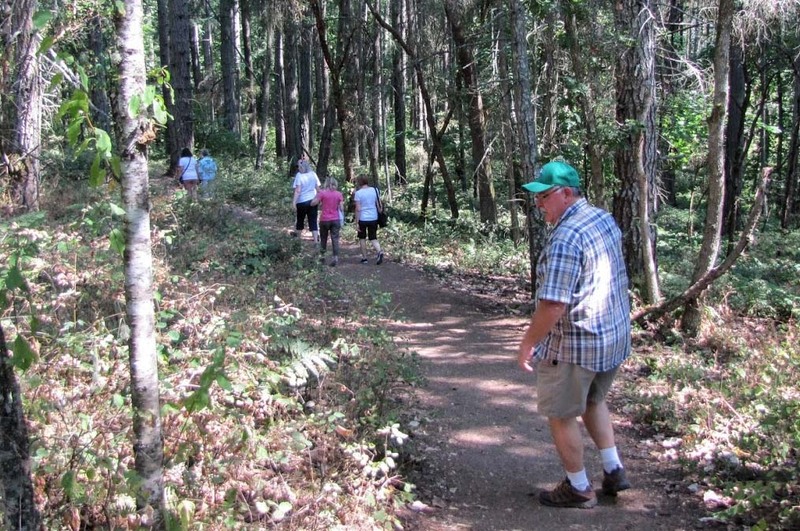 We then hiked over the trails that lead in the direction of Interurban Road. There is another entrance to this park off of Trevlac place. We turned around when we came to the far side of the park and hiked back the way we had come. This park takes longer to visit than you would expect. We were a little late for our lunch a the Med Grill in Royal Oak. 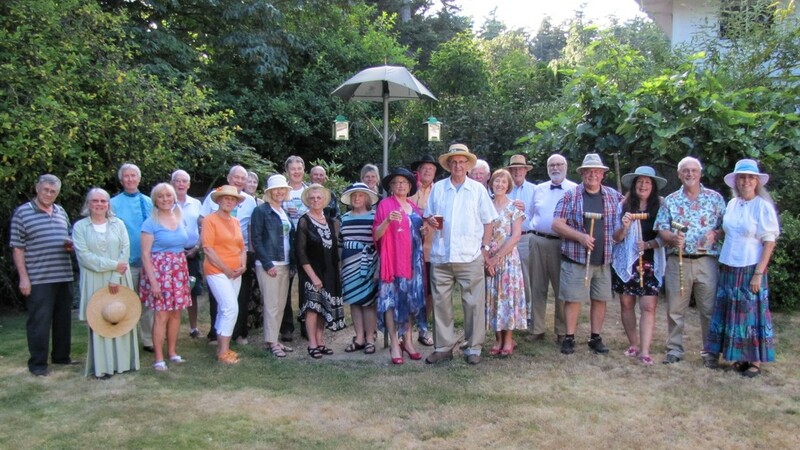 Fun was definitely had by all who attended the CanRambler's summer party, hosted this year by Martin and Trudy. The theme was "Garden Party" and the weather couldn't have been more perfect for it. The pot luck appies, salads and desserts were all delicious, and everyone was friendly and happy. Not only did Martin and Trudy open up their beautiful home and back yard for the occasion (complete with wildlife visits by ducks and a raccoon), but Martin and his band "Soup to Nuts" provided wonderful live music on the patio, including the song "Garden Party". Before that, John A. wowed us with some of his new magic tricks, and as a hostess gift he presented Trudy with a framed photo of Martin that converted from outline to full colour. Truly amazing! 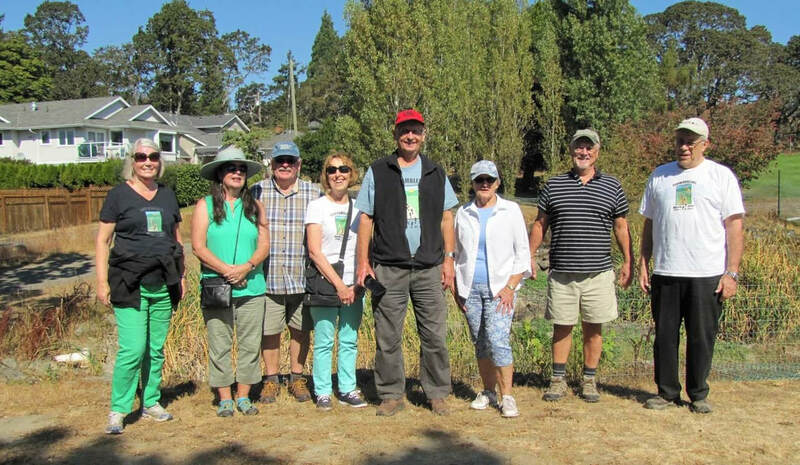 This time there were twenty of the CanRamblers who met at the Heritage Acres site of the Saanich Historical Artifacts Society in Central Saanich to walk the nature trails that go most of the way around the perimeter of the property. This was a new trail for the CanRamblers and some of us had never been to this wonderful place where there is so much to see and do. The little trains were not running this day but there is a complete list of the days when everything is operating on the web site for the society. https://visitorinvictoria.ca/train-rides-heritage-acres/ The site is open every day from 9:30 am to 4:00pm and there is no charge for entry except on the special event days. It usually costs $10 per car load on the special event days. The Vancouver Island Model Engineers built all the tracks, bridges etc.and also run the trains. A small donation is expected for those who ride the trains, payable at the time of the ride. ​Fifteen of the group went to the Prairie Inn today for a lovely lunch after the walk. We know that there isn't enough room for all of our cars to park at the Gorge Point Pub, and go for a walk that lasts over an hour; so we parked on Uganda Ave. about a block away and walked up to Admirals Road and over the bridge to the Gorge Parks that are on the "other" side of the bridge. First of all we walked down to the float to watch the tidal flow out from under the Gorge Bridge. A seal was seen waiting for a fish to get swept into his waiting mouth. Then we walked the main trail that went past the main part of the park, the community gardens, and onward to the rocky point that gives us a nice view up and down the Gorge. We noticed somebody swimming across the Gorge pushing a blue box in front of their-self. What a way to take your re-cycling to the depot. We then walked up to Gorge road and crossed over to the other Gorge Park and walked along to the Victoria Canoe Club patio and wharf. It was then time to head back to the Gorge Point Pub where we found Marion and Wenche waiting at our reserved table. I think that most people had a nice lunch. With fifteen of us it took quite a while for everyone to be served. Most of the people in this photo are CanRamblers. A few other people joined our tour of the museum. 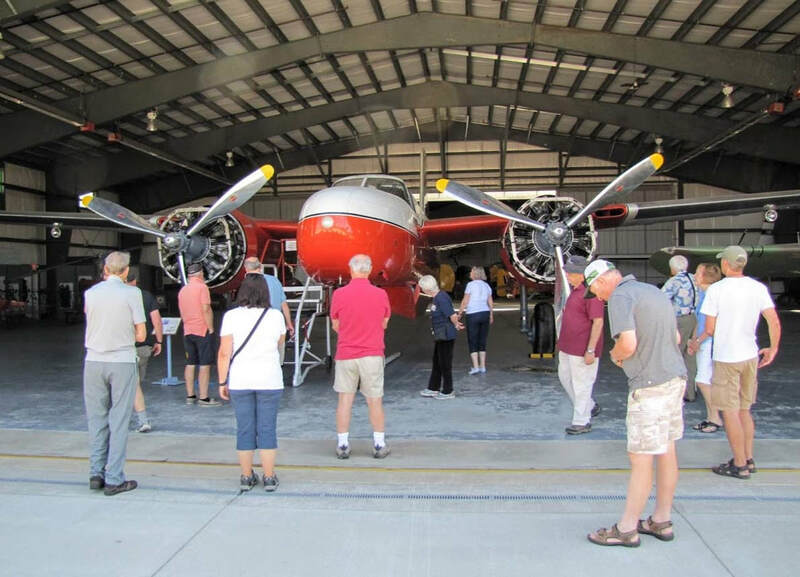 Twelve of the CanRamblers went out to the Sidney area (Victoria International Air Port) to have a tour of the BC Aviation Museum on a day that was probably too hot for walking anyway. Our guide for this tour was Gordon Campbell who is a volunteer at the museum and a retired pilot with Air Canada and Trans Canada Airlines. We had over an hour and a half visit to the museum and learned a lot about the Victoria Airport's history during both the war years and about the planes that were built and flown in this area. I think that we all had a great experience and saw a lot of aviation history. Soon the museum will have a Lancaster bomber on display. You should go there! Our lunch destination was just across the road at Mary's Bleue Moon Restaurant. The service was quite fast and the food was good too. The group starts off from the Oak Bay Marina. 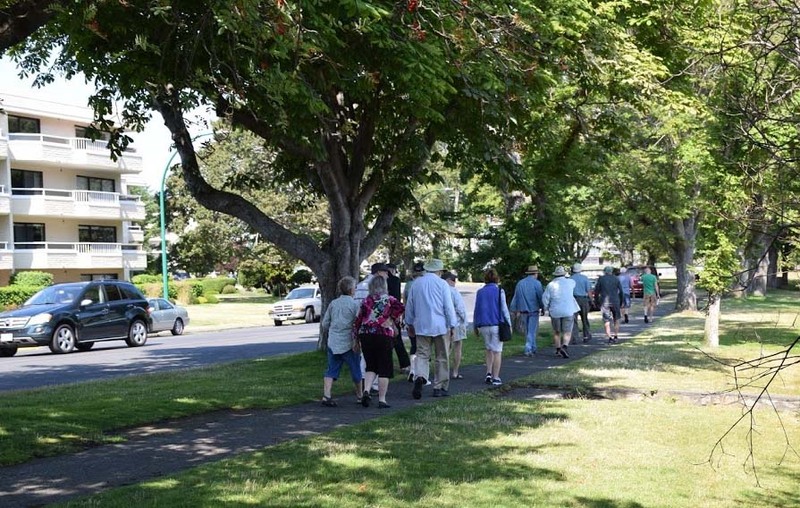 To beat the heat on these warm summer days I planned a walk along some of the Oak Bay waterfront where we were cooled by the ocean breeze and then a walk back to the starting place through one of the older residential streets that are shaded by huge mature trees. St. David Street has a really nice collection of unique character homes and beautiful gardens. We found a couple of picnic tables in Queens Park which is a nice green point of land right beside the Oak Bay Marina. Those who wanted sun had a sunny table; those who wanted shade got their table too. ​Today’s walk was very pleasant, cool in the shade and warmer as the tree canopy thinned. The light was very good for taking pictures, some interesting highlights. Wenche took the lead and took the group on a walk that made good use of most of the lower trails. Walk # 344 August 15th 2018 A summer walk along the Dallas Road waterfront. 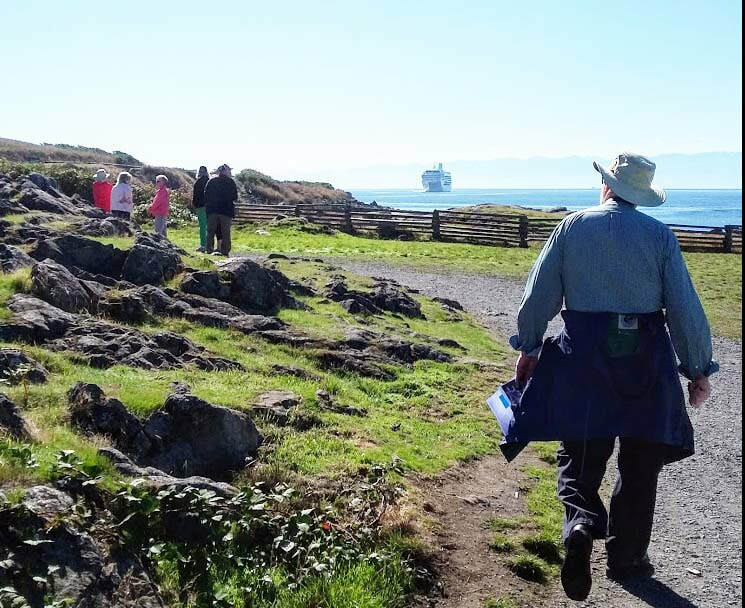 Fourteen CanRamblers walked along the seashore at Dallas Road. A little bit of smoke haze from the forest fires in BC's interior didn't faze the CanRamblers. There were some interesting colours to the sky and sea, it was impossible the see where one ended and the other began. A rather large group turned out for the walk along Dallas Road from the Harrison Yacht Pond to the Ogden Point Breakwater and back. Yes, they did walk all the way out to the end of the breakwater and back. No cruise ships were in port but from the several foreign languages that I heard there were a lot of visitors in Victoria that day. We walked both on the path and on the beach. 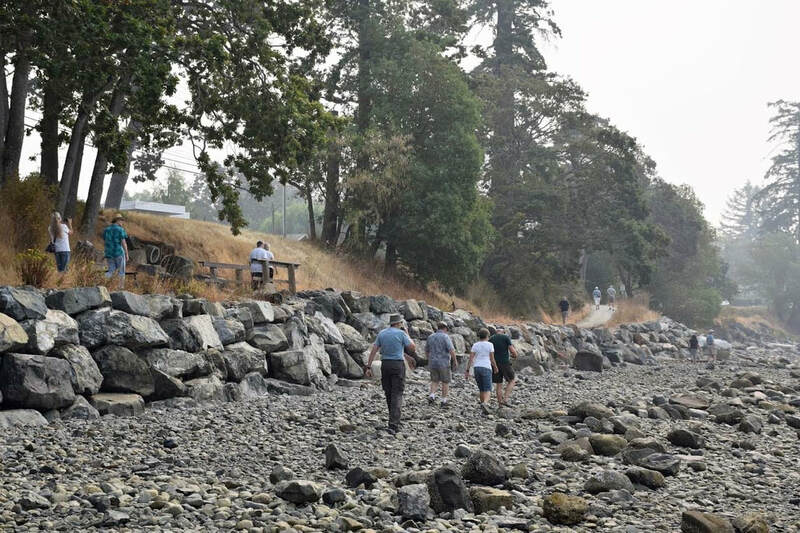 Fourteen of the CanRamblers met out at Patricia Bay Park to walk the shoreline path that follows the beach towards Deep Cove. Some rock wall work was under construction for a short part of the walk, but we managed to avoid that short section and the men building the rock wall. We weren't going to obey the Trail Closed signs. Some of us walked back on the beach, and that was nice too. Next we drove up Mill's Road to stop at the Lost Airmen Memorial site at the side of the airport. Look for a wide shoulder on the side of the road and park there. This compact site has iron "feathers" that have the names of the air crews that passed away from flying accidents, war etc. Finally we drove a little ways up Mill's Road to where the Fickle Fig Farm Market and the Howl Brewery are located under the building with the red/orange roof. Free tastings were provided of many of their craft brews. Most of us were impressed with the quality of the beers and ales that they make there. If you go there you need to check their daily schedule and take a growler with you because they don't bottle any of their beers yet and they are not open every day of the week. We drove onward to the Prairie Inn for a very nice lunch afterwards. The only downside of the day was the smoky air from the forest fires. Find Howl Brewery on Facebook, there's no website yet. Walk # 346 August 29th 2018 The Lochside Trail to Uptown from Mckenzie Ave.
On the Lochside Trail, starting out. 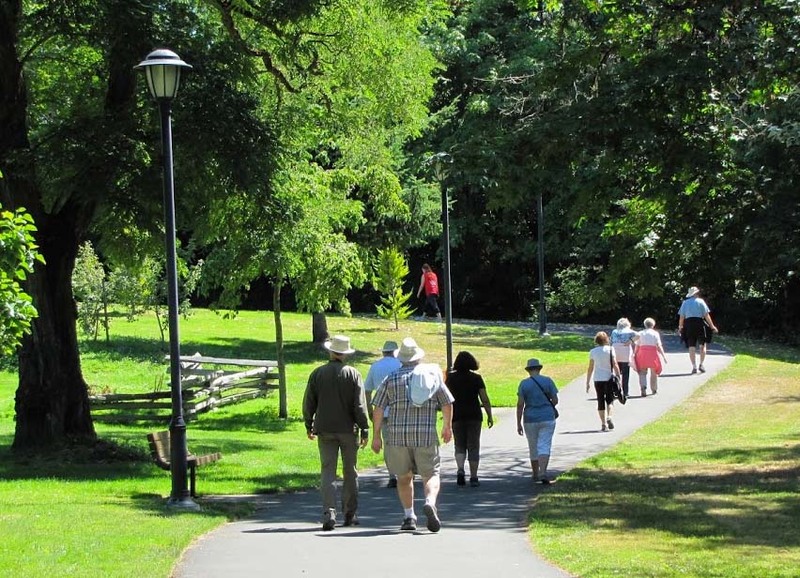 The CanRamblers met at the corner of Mckenzie and Borden for a walk along the Lochside Trail as far as Uptown mall or as far as they wanted to walk. The surface is paved which makes for a little more wear and tear on the feel and legs. The day started off with a few showers, but it was sunny and quite warm as we were walking. The rain seldom falls on the CamRamblers. We gathered at the Monkey Tree Pub for lunch. It was good as usual. The CanRamblers met at the parking lot near the clubhouse for the Cedar Hill Golf Course and walked anti-clockwise around the top end of the golf course on the chip trail. The weather was just right. When we got to Kings pond we were surprised to see how low the water was. There were not as many ducks around either. We continued to the top of the steep hill on the chip path and then turned around and went back to the path that leads across the middle of the golf course. It was time to head to Maude Hunter's Pub for lunch. Walk # 348 September 12th 2018 A walk through Mystic Vale at UVic. 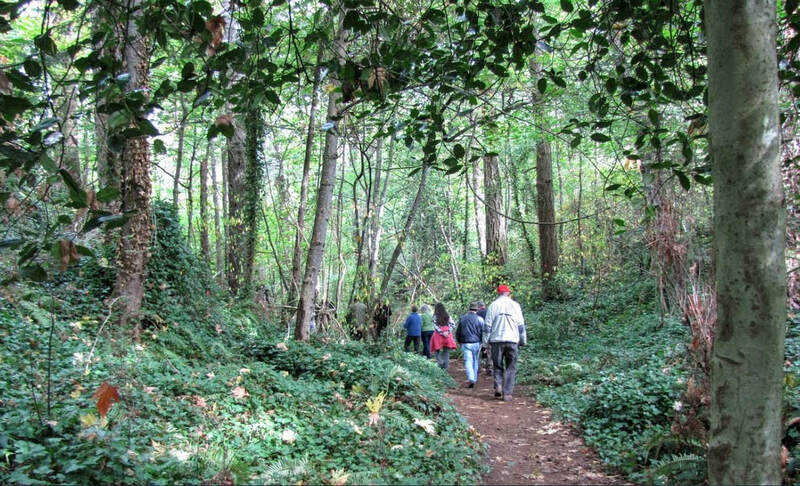 The group walks through one of the Mystic Vale trails. The Mystic Vale woods at UVic are beautiful at every time of the year. For this walk I chose a path that's not that easy to find as it is at the back of some long grass near the corner of the UVic Dog walk fields. This path takes you on a gentle downward trending trail that leads to the pond area where four trails go in every direction of the compass. We took the one that goes alongside the stream and leads over towards Sinclair Rd. When you eventually come to the gate at the end of the trail you walk another 25 feet and you will come to another path on the left that goes up at the edge of the forest and comes out near UVic House #4. Keep walking past this and the other larger house/office and you will come to another main trail on the left that leads you back through the forest at the top of the Vale and towards Cedar Hill Cross Road where you started from. All of this walk is easy, no stairs to climb, and it should take only about an hour from start to finish. This is the most quiet piece of forest parkland that we have ever walked in. Dave leads the group Napolian style; from the rear. 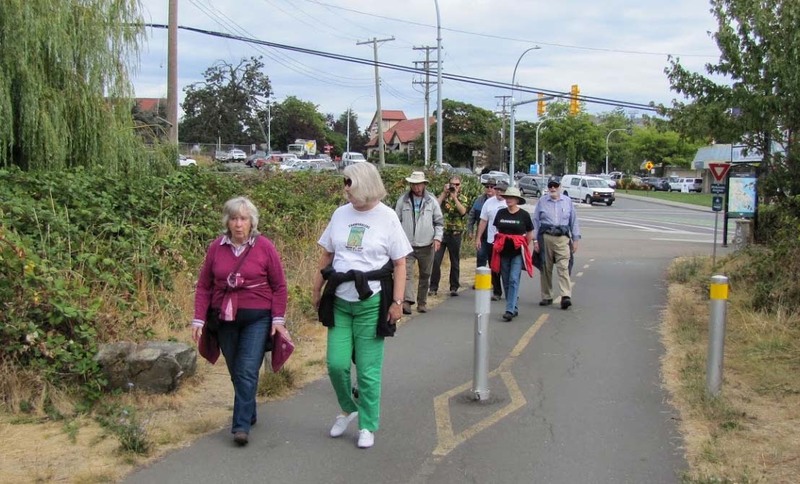 We started our walk at the boat-launch parking lot in Esquimalt. In gorgeous fall sunshine we walked past the steep stone wall used for mountain-climbing training. Rounding a corner, we spotted a BIG cruise-ship heading straight for us! It turned at the last ‘second’ heading for docking at Ogden Point. 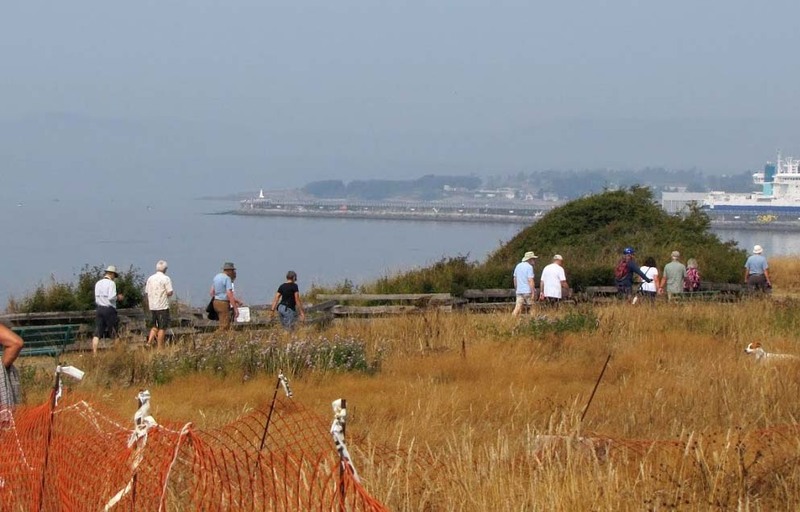 Our planned walk was blocked by a fence due to the construction of the Macaulay/McLaughlin point sewage treatment plant. Another construction fence blocked our way back towards the parking lot. No problem, we just walked on finding our way around the construction. We had lunch at the Gorge Pointe Pub.